The UN said it was prepared to use “lethal force” to protect civilians if the M23 advanced towards Goma. 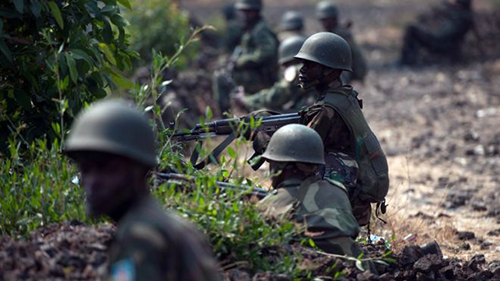 A Uganda rebel group based in DR Congo – the Allied Democratic Forces – raided the town of Kamango, which has been since been retaken by the Congolese army. The BBC’s international development correspondent Mark Doyle says the widespread fighting illustrates how difficult the task of the new UN offensive force will be. UN peacekeepers are on “maximum alert” to protect Goma as battles continue near the strategic city, the capital of North Kivu province. “What’s important is to go back to Kampala to negotiate. We have been there for six months waiting for [President Joseph] Kabila but he refuses to talk to us,” he said. The M23 rebels, who like Rwanda’s leaders are mainly from the Tutsi ethnic group, mutinied and deserted from the Congolese army in April 2012, forcing an estimated 800,000 people from their homes in the ensuing unrest in the mineral-rich region. A UN report leaked earlier this month says Rwanda is now only providing “limited” support to the M23 rebels and Uganda none at all. Both countries had denied allegations in an earlier UN report that they were arming the group. The BBC’s Catherine Byaruhanga in Bundibudgyo, on the Ugandan border with the DR Congo, says many refugees fleeing the ADF attack are staying with Ugandan relatives. According to the UN, the ADF has recently expanded its military capacity and established links with Somalia’s al-Shabab Islamist militants.